Both Willis and my own positions emerged out of our own personal experiences living and working among tribal people’s and the rural undeveloped, and I think shows a real sensitivity about their lives – just at rather different scales. The crux of the issue between Willis and several of his commenters at WUWT and myself isn’t so much of an ‘issue’ as it is a real difference in the scope of the problem that we are addressing. Willis seems to content himself with making, as one commenter put it, “the iron age” existences of the rural, up-river, out-back poor a little easier. My criticism of Willis’s project, despite its good points, is that it will do very little to solve the real problems of rural poverty which has a great deal to do with the general lack of development and lack of productivity of the adult populations due to lack of energy access [lots of lacks] – not that I’m against making poor people’s lives a little easier. I followed up a few days later with a post Fisked by Willis where I outlined this problem in further detail and presented Willis’s critique of my own position. I pointed out the liberating effect, especially upon poor women, of the availability of electricity and the labor saving devices they enable, closing with a link to this TED talk from Swedish medical doctor, academic, and statistician Hans Rosling: The Magic Washing machine about the significance of the role of the washing machine in the transition modern society. That was a week ago, suddenly Pielke the Younger produced a graphic that illustrates perfectly the scope of the problem as I see it, and the problem that, in my opinion, renders the Powerhouse School Concept as little more than a stop-gap to a much larger issue – an observation that Willis and some others took umbrage at. We’ve made an attempt at such an estimate here for current demand in the six countries targeted by President Obama’s new signature initiative, Power Africa. In each we use three different thresholds: the IEA’s minimum and the average consumption profiles for Tunisia and South Africa. (The full, nerdy explanation of the demand model is explained below.) Admittedly, it’s very, very rough, but the size of the gap is massive. 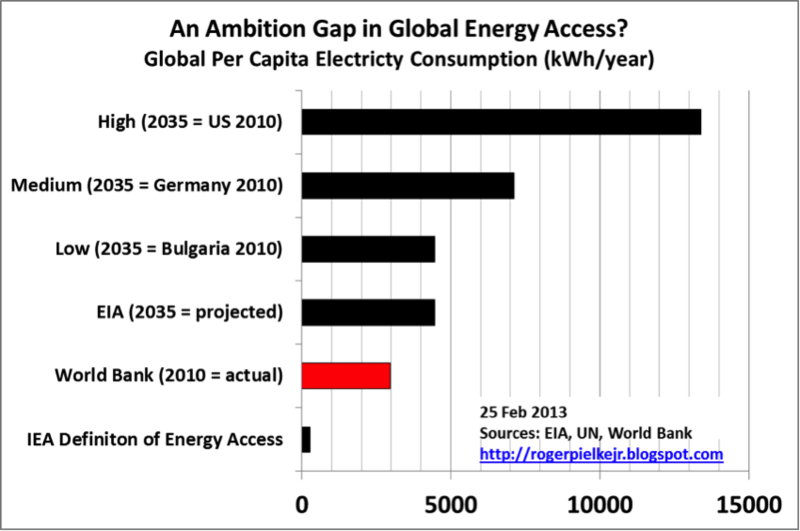 Pielke the Younger has another article in the same vein at the Breakthrough Institute: How Much Energy Does the World Need? 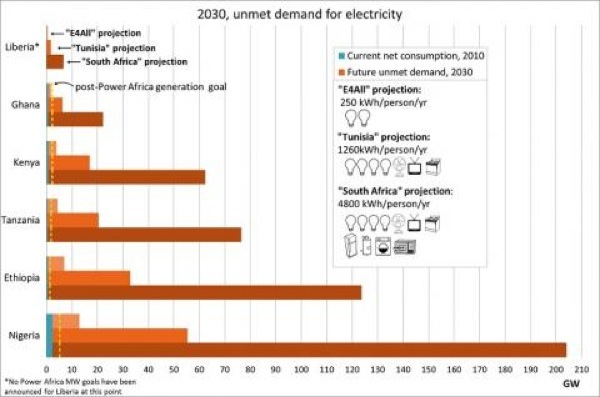 where he lays out present  energy consumption patterns for the world and scenarios where by 2035 the ‘rest of the world’ is brought up to 2010 consumption levels characterized by current levels of energy consumption by Bulgaria, Germany, and the United States respectively. Notice what the International Energy Agency defines as “energy access”, about 250 kWh per household per year, or about 2% of that used in the average American household. When you look at the numbers for energy generation that would be required to bring ‘the rest of the world’ up to the present levels of even a Bulgaira or Germany, they are truly staggering. 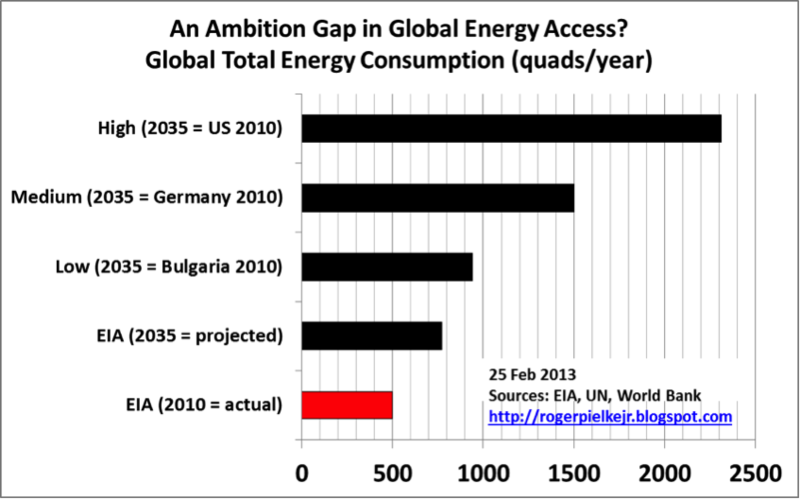 Current global energy consumption stands at around 500 quads of energy per year. Looking at these numbers is it any wonder that people – in the developed world – start to form a kind of ‘drawbridge mentality’ about energy consumption in the developing world? Attitudes start to become zero-sum, meaning if the ‘rest of the world’ develops, the ‘real world’ must ‘de-develop’ and everyone has to learn to expect to live without very much access to energy – and at all costs energy must be made very expensive to keep people from using too much of it. What we really need is some better kind of ‘bridge building’ – the right kind of engineers. To keep the majority of the Earths population at a level of “energy subsistence” or “energy starvation” is in my opinion, inhumane. What do you think? This entry was posted in Economics, Energy, Uncategorized and tagged Breakthrough Institute, Center for Global Development, energy access, energy poverty, International Energy Agency, Roger Pielke Jr, TED by w.w.wygart. Bookmark the permalink.